"Filled with enough political machinations and symbolically laden visions of a war-torn future to sate the appetite of all graphic novels readers as well as Game of Thrones fans longing for fresh content with a scholarly attention to detail and keen psychological insight." Talk about saying a lot with as few words as possible. This guy could write comics. And to illustrate the "war-torn future" that Publishers' Weekly mentions, here's yet another sample of artwork from A Thousand Ships, featuring the beautiful coloring of John Dallaire. 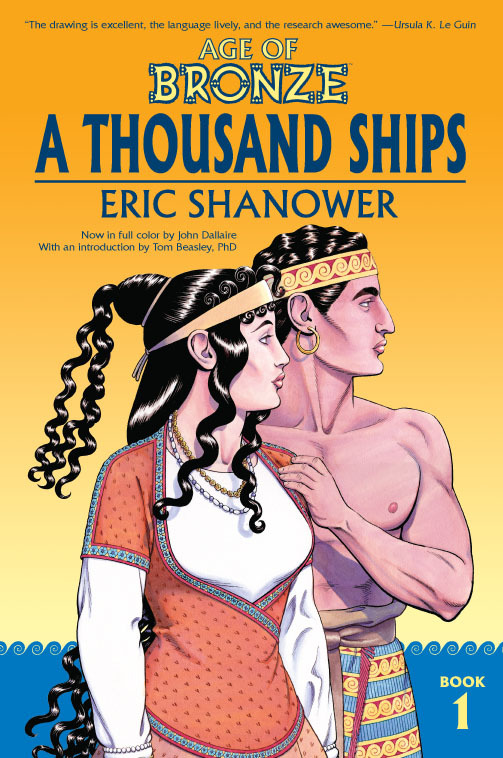 Jamie and Shiri of The Great Big Beautiful Podcast interviewed me recently about the new color edition of A Thousand Ships, about Age of Bronze in general, and about the rest of my career. It was a fun interview and I hope you'll enjoy listening to it at the link here. 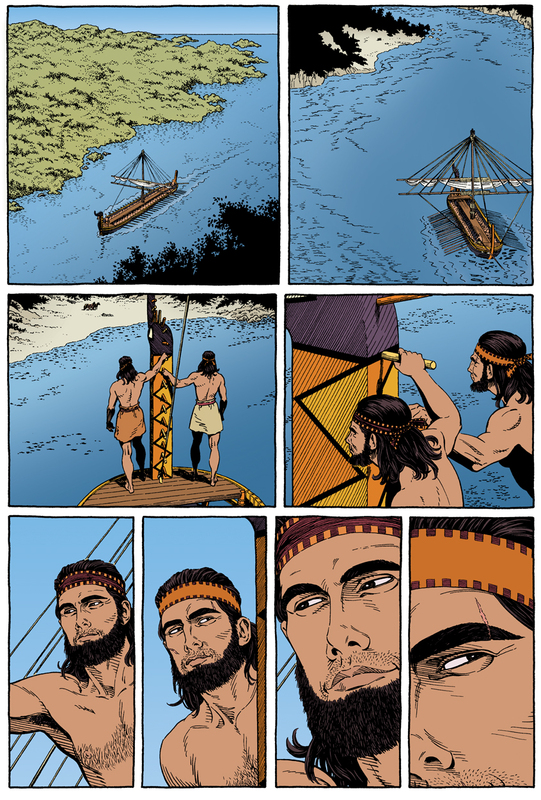 And here's another sample page of artwork from the new color edition of A Thousand Ships, featuring coloring by John Dallaire. Got a problem with male functionality? 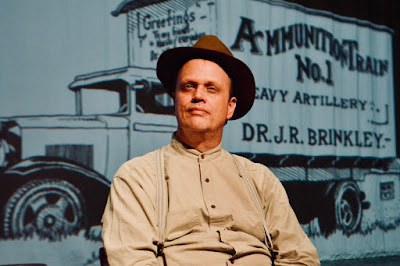 See Dr. J. R. Brinkley. He'll insert goat testicles into you! Surely, you say, no one would be stupid enough to buy into this trumped up impotence cure. But back in the good ol' 20th century US of A, people did. 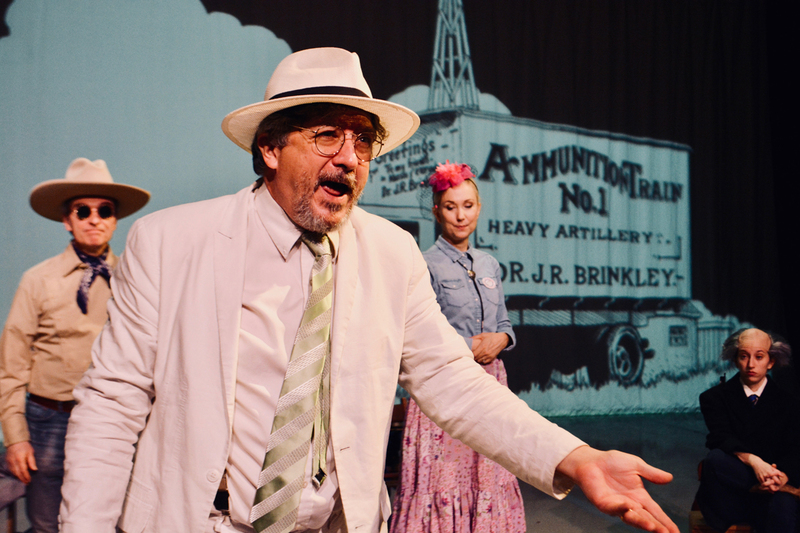 And on the strength of his popularity Brinkley ran for public office. Edward Einhorn's newest play The Resistible Rise of J. R. Brinkley brings you the true story of the charlatan who performed this bizarre, stupid, and ineffective impotence cure and achieved a level of success difficult to believe. Well, maybe not so difficult. Trumped up trumpery even more bizarre, stupid, and ineffective is trumpeted these days, too. And people buy it. 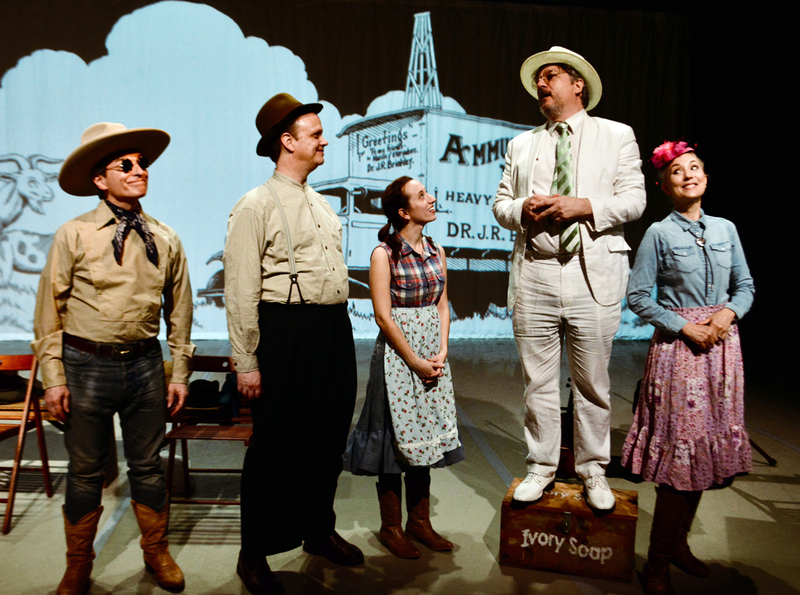 But anyway, I designed and drew the images projected as backdrops for The Resistible Rise of J. R. Brinkley, which runs October 12-28 as part of FringeNYC, this year's New York Fringe festival. For details on the play, click here. On October 26 and 27 come attend the Pulp Culture Comic Arts Festival and Symposium 2018 at the University of Vermont in Burlington, Vermont. 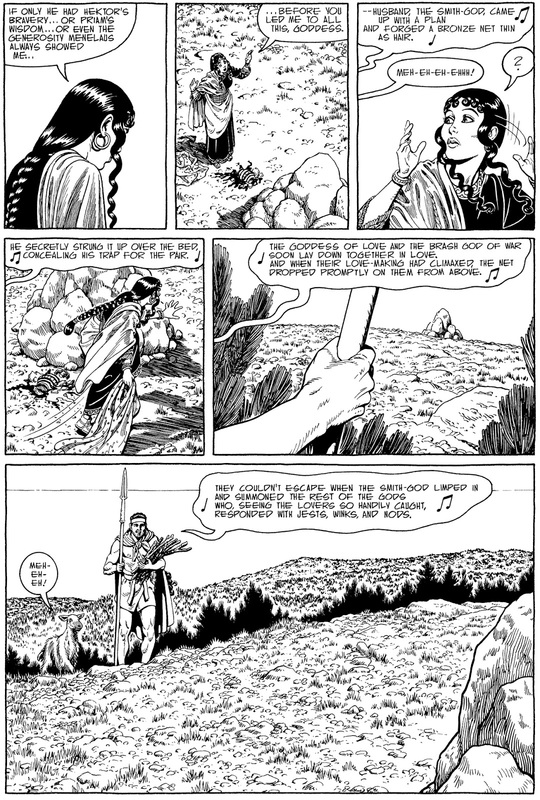 I'll be speaking Saturday, October 27, on a panel about Classical Mythology in comics, along with panelists Glynnis Fawkes and Guy Hedreen. I'll also have a table in the exhibition hall where I'll be signing autographs and you can say hi and find plenty of Age of Bronze comics and graphic novels. 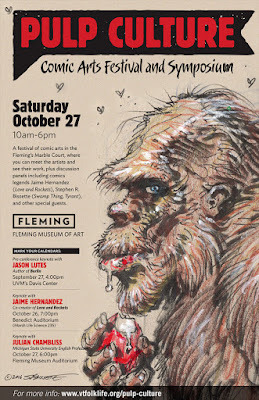 One of my favorite cartoonists, Jaime Hernandez, is a keynote speaker on Friday, October 26. My plane arrives a couple hours before he's scheduled to go on. I sure hope I have a chance to catch most of his speech. For details on the festival click this link. For a schedule of panels click this link. For a guide to the exhibition hall click this link. The current Back Issue magazine, no. 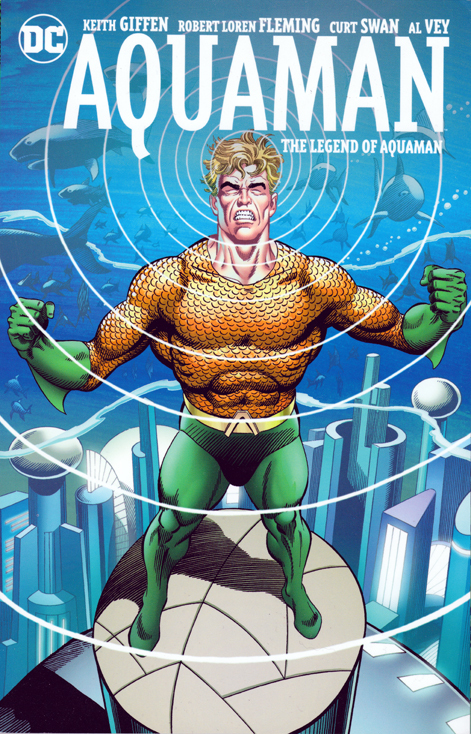 108, is devoted to the character Aquaman. It sports a cover I drew, featuring the king of the ocean. 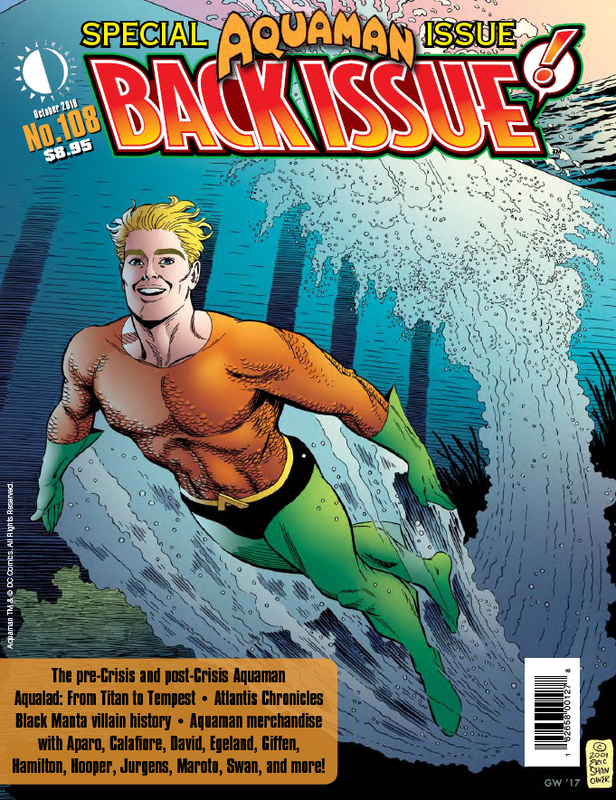 Inside many articles discuss the differing treatments of Aquaman throughout the years. 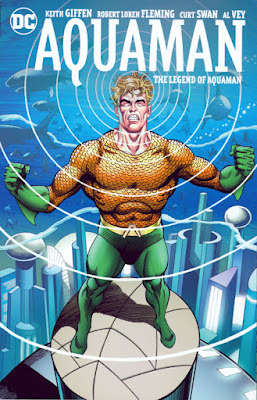 Aquaman swam across my drawing table a couple times in the 1980s, when I drew the Secret Origin of the Justice League of America and I inked Curt Swan's pencils for The Legend of Aquaman Special, and once in the '90s, when I inked an Adam Hughes Aquaman cover. John Trumbull interviewed me for an article inside the magazine. 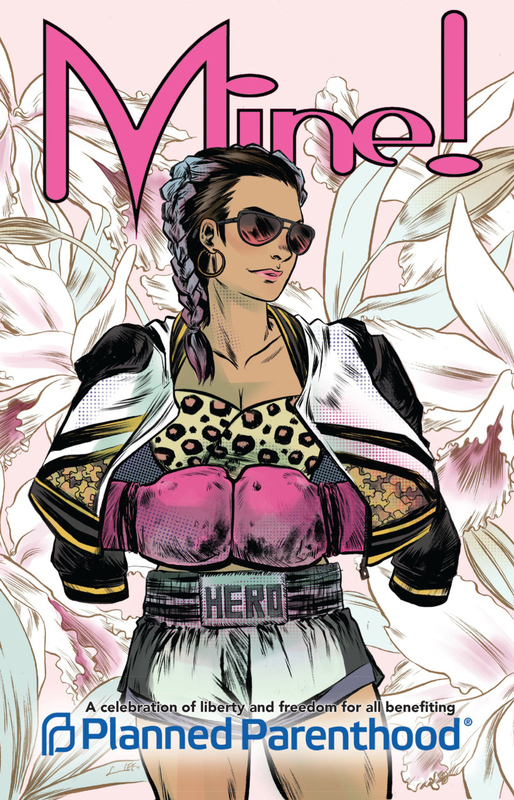 Back Issue is published by TwoMorrows and is available in print now at your local comic store and digitally online from the publisher at this link. When I mention to people that I'm drawing the Stooges, I'm often asked whether I'm drawing Shemp. No, this line-up of the Stooges is Moe Howard, Larry Fine, and Curly Howard. The stories are set in the mid-1930s. The coloring is in gray tones to simulate the look of a black-and-white motion picture. The Three Stooges: Matinee Madness strives to bring you the experience of a vintage Stooges movie short. 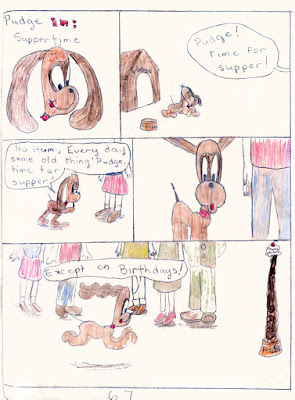 The first of the stories I drew is called "Shaky Bakers." The Stooges are called to a mansion as exterminators during a dinner party. Somehow they end up in the kitchen as dessert chefs. Slapstick and spooky shenanigans ensue. The second story is "Loons on the Lagoon." The Stooges are running swamp tours, but when a gang of hard cases shows up, they're shanghaied into the middle of a lab experiment gone awry. Anyone who loves the classic Three Stooges will want to read The Three Stooges: Matinee Madness #1. "Shaky Bakers" artwork before lettering and tones. 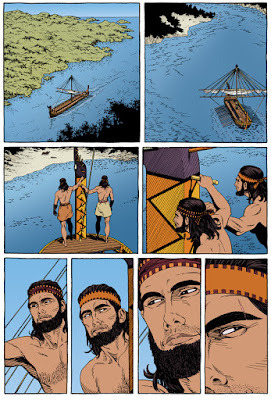 A Thousand Ships, the first volume in the Age of Bronze graphic novel series, will be published in full color on September 12 by Image Comics. This new edition with color by John Dallaire is a major upgrade from the black-and-white edition that's been available so far. 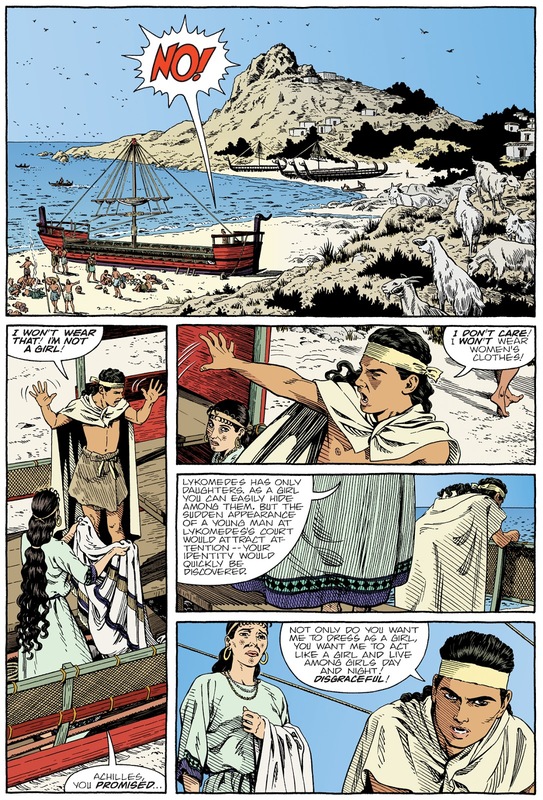 The additional dimension of color in the detailed costumes and sweeping landscapes of A Thousand Ships will immerse readers more fully into the story of the Trojan War. 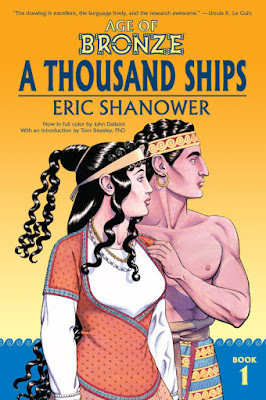 New features are included in this color edition of A Thousand Ships. I've designed a new cover showing Helen and Paris (see image on left). Tom Beasley, PhD, Visiting Assistant Professor of Greek and Roman Studies at Vassar College, provides a new introduction. 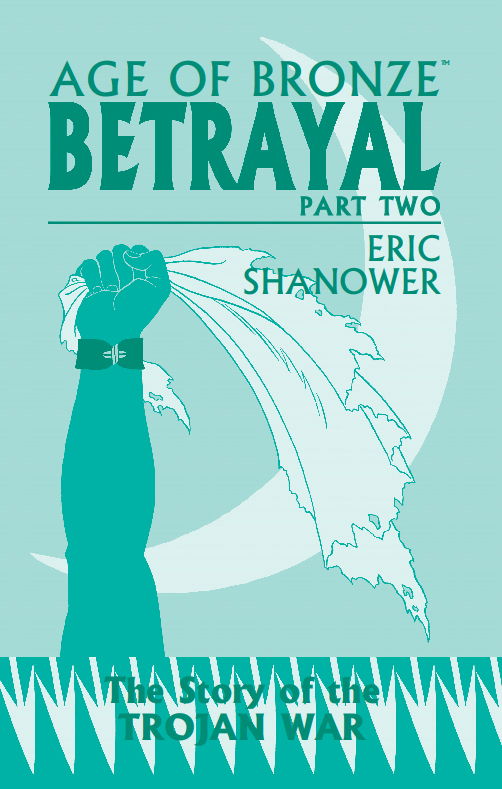 And I've updated the Afterword and added a couple color illustrations to it that have never seen print before. How did this color edition come about? John Dallaire began coloring Age of Bronze for digital publication a few years ago. The digital edition of Age of Bronze didn't run very long, and it's been defunct since the digital publisher ceased operations in 2016. 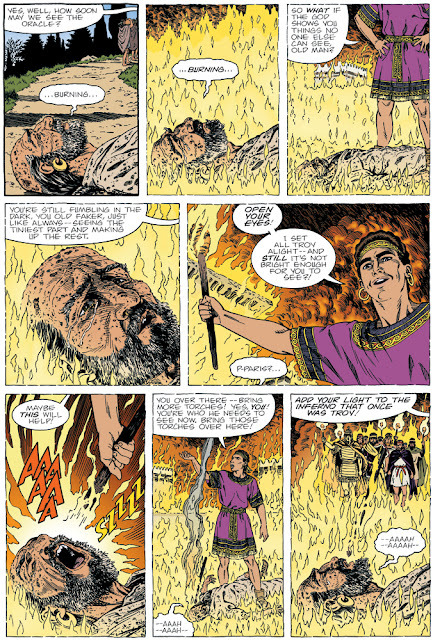 But I planned to publish Age of Bronze in color eventually, so John kept on coloring. In case any reader is concerned that a version of Age of Bronze colored by someone else will dilute my vision of the whole project, let me lay those concerns to rest. John Dallaire colors Age of Bronze under my supervision. Not direct supervision, since we're on different sides of the USA. But I have final say on every single color that appears in Age of Bronze. I send John copious notes on each and every page. He's wonderfully patient and follows every note. Each page goes through an average of four versions before I stamp it with final approval. Still, I try to leave room enough for John's creativity to shine, and he's come up with some beautiful results in coloring my artwork. You may have seen the color version of Age of Bronze issue #1 that was released a few months ago. (Click here to see sample pages.) That color issue gives a taste of what A Thousand Ships looks like. John Dallaire works with a full range of color, using a restrained style, so that the lines of artwork aren't overwhelmed. 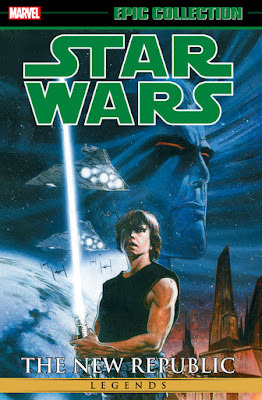 It's color in support of the story--color that lets the characters live rather than suffocating them. A Thousand Ships is the first volume in the story of the Trojan War. 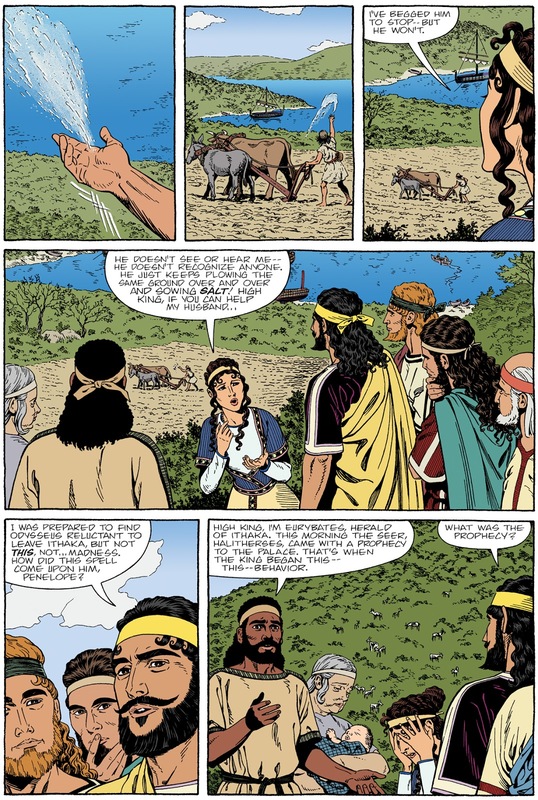 It starts with the young cowherd Paris, who travels to the great city of Troy to recover his prize bull taken from him by Priam, Great King of Troy. In Troy the startling secret of Paris's past catapults him onto a fateful path leading to an immense clash between nations, the legendary Trojan War. 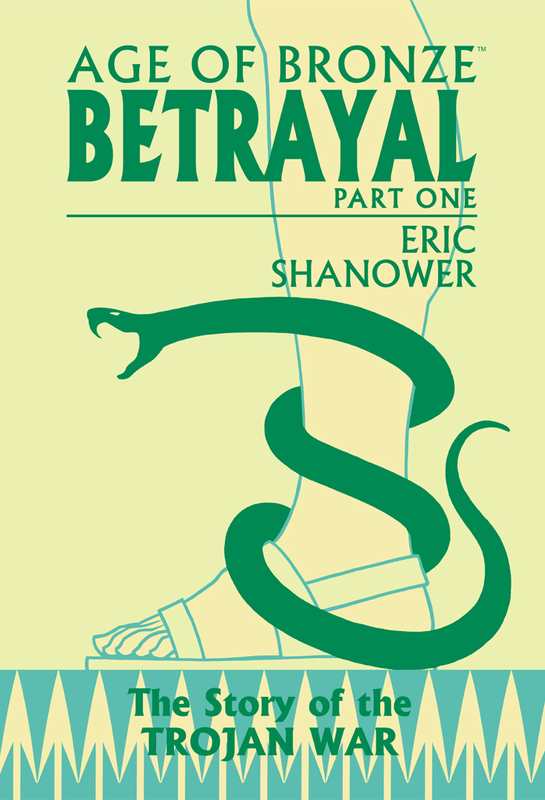 Meet the classic characters of the story: Helen, reputed to be the world's most beautiful woman--Achilles, destined to die a great warrior unless his mother can save him--Agamemnon, the proud and stubborn leader of the Achaean forces against Troy--Odysseus, the island king who wants nothing to do with war--and many more. I've been drawing comics featuring characters I knew in my childhood. First up is Casper the Friendly Ghost and his whole supporting cast. Since their original cancellation in the early 1980s, the Harvey characters have seen only sporadic publication. Until recently. Now the publisher American Mythology has the license to Casper and his supporting characters, including the little devil Hot Stuff. Hot Stuff crossed over with Casper back in the day, but he was never a bonafide supporting character in the Casper cast. That's changed now. So I've been drawing stories featuring Casper, Wendy, Spooky, the Ghostly Trio, Hot Stuff, Pearl, and Princess Charma. I think it's fun! When I first became a professional cartoonist I wanted to draw for publication all the comic book characters I'd loved as a child. I figured I'd never have a chance to draw the Harvey characters. That ambition fell by the wayside years ago. But now I'm another step nearer to fulfilling it. Casper and Hot Stuff #1 came out several weeks ago, but should still be on sale at your local comic shop. I drew one of the several variant covers, as well as a couple stories inside. 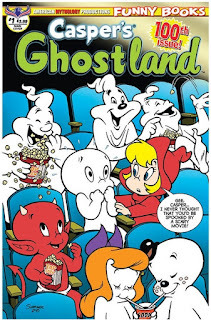 More Casper comics drawn by me are on their way. American Mythology also has the license to publish Three Stooges comics. I watched Three Stooges movies on television when I was a kid, but I hadn't seen one of their movies in years--until American Mythology decided to re-think its approach to the Stooges and asked me to take a shot. I was happy to try. As research I watched some Stooges movie footage on YouTube. 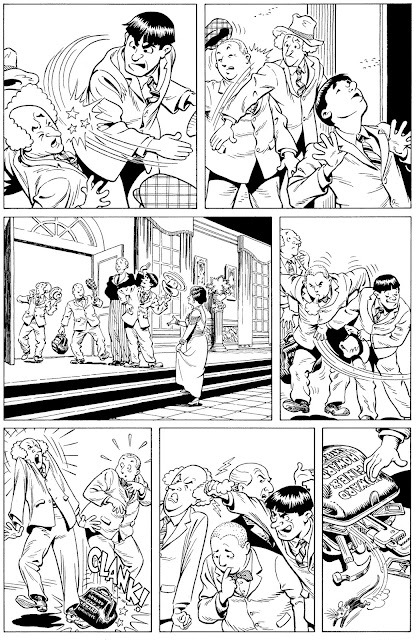 The editor and publisher liked my approach, so now I've been drawing Three Stooges comic book stories, too. The new approach places the Stooges in the 1930s, so they're period pieces, as if these stories are actual shorts the Stooges filmed. They feature the original Stooges line-up of Moe, Larry, and Curly. The coloring is in black and white to replicate the sense of a black-and-white movie short. The Stooges never held a similar place in my heart as the Harvey characters do. But it's fun drawing their silly slapstick abuse of each other. 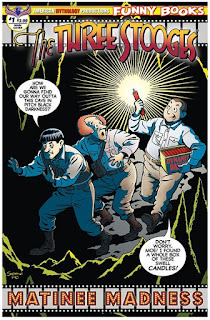 Three Stooges: Matinee Madness #1 goes on sale toward the end of August. I drew one of the several variant covers and a couple stories inside. Mine!, the anthology I contributed a story to, has been nominated for Best Anthology in the Ringo Awards. Comicmix published Mine! late last year as a benefit for Planned Parenthood. 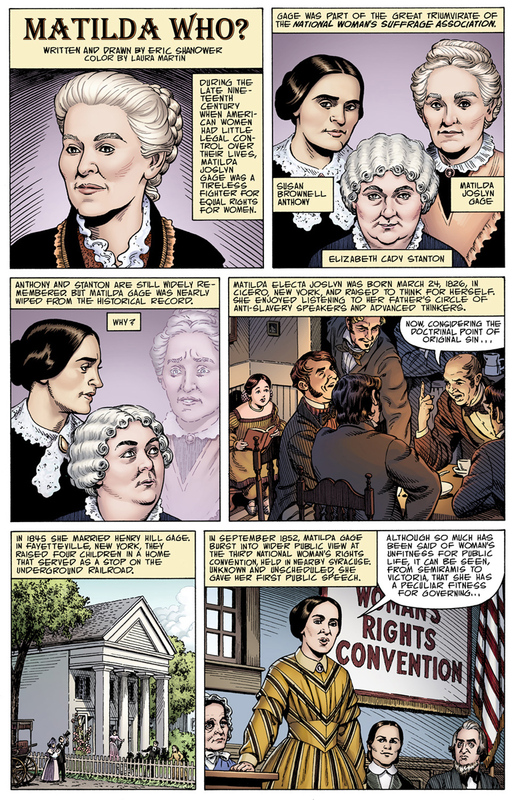 I wrote and drew a four-page story about Matilda Joslyn Gage, the nineteenth century activist and mother-in-law of L. Frank Baum. The Ringo Awards are the comics awards that the general public may vote on, so if you'd like to cast a vote, go here. 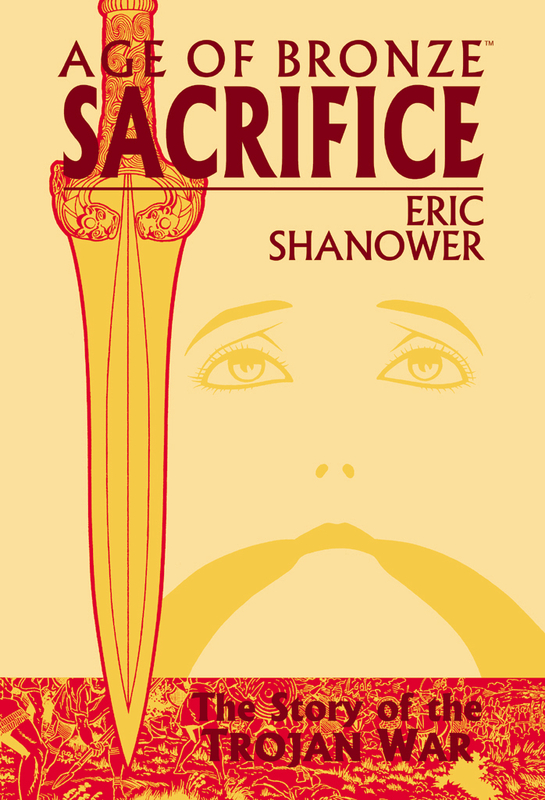 And if you'd like a copy of Mine!, it's still available from your favorite comic book store or bookseller. On Saturday, June 2, from 11 am to 4 pm, I'll be exhibiting at the Olympia Comics Festival at the Olympia Center, 222 Columbia St. NW in Olympia, Washington. Immediately following that at 4 pm, I'll be joining Olympia Comics Festival's special guests, cartoonists Farel Dalrymple and Shannon Wheeler, for a round table discussion moderated by Frank Hussey of Danger Room Comics, the sponsor of the festival. So if you're in the area on Saturday, come to the festival and see me and much more! Here's the link to the Olympia Comics Festival website for more details. Big news! Big changes for Age of Bronze. 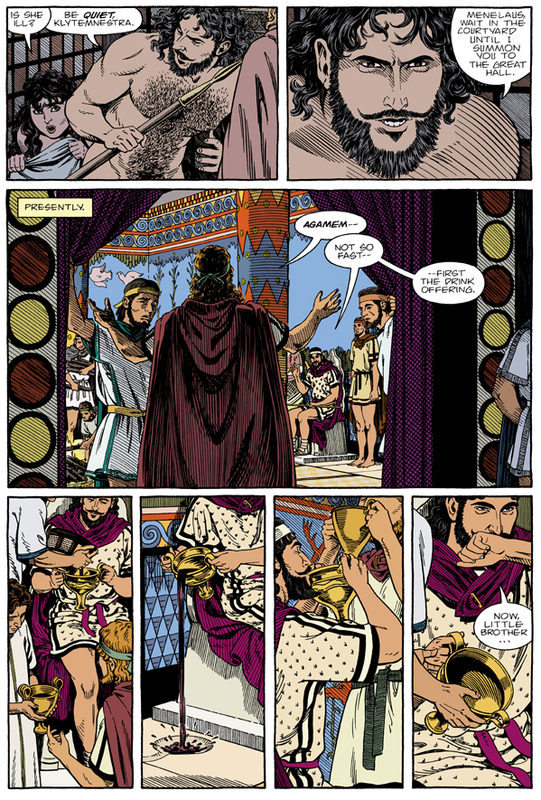 For the first time ever, Age of Bronze will be printed in full color. No more black and white. All new Age of Bronze material will be published in full color by Image Comics. 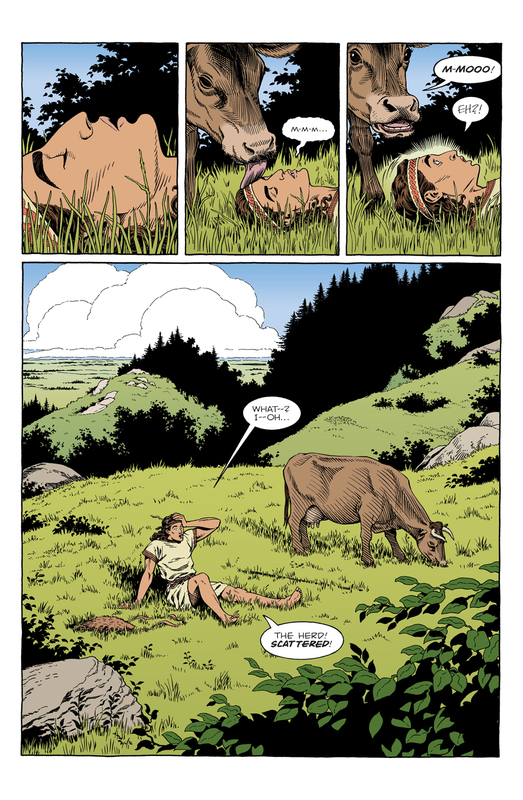 All old Age of Bronze material will be reprinted in full color by Image Comics. You'll see the story of the Trojan War in a whole new way. 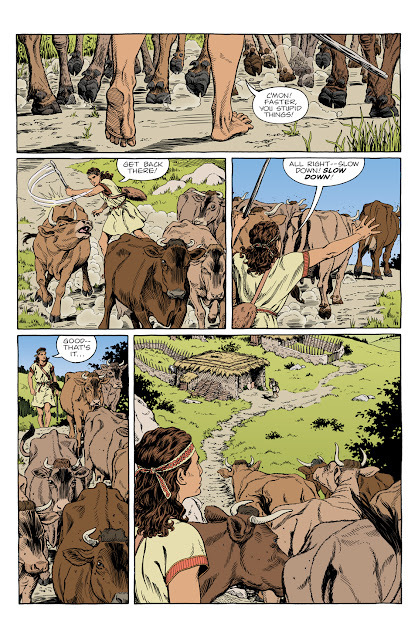 I've been working with John Dallaire, Age of Bronze colorist, for several years in preparation for color publication. John and I were matched up in 2011 for Throwaway Horse's digital publication of Age of Bronze. 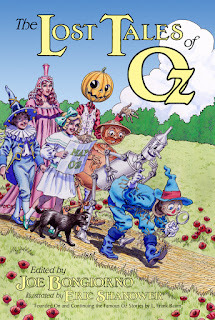 Several issues were published digitally before Throwaway Horse ceased operations. But John continued coloring Age of Bronze under my direction. We knew that Age of Bronze would be printed in color one day. 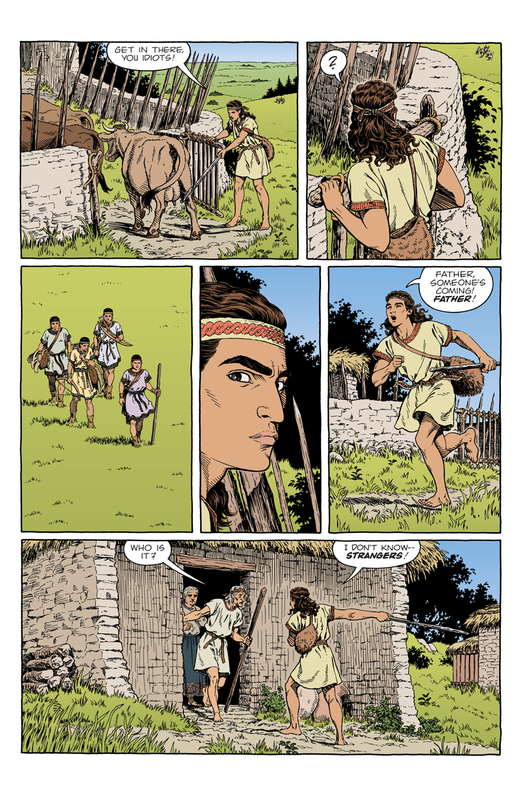 First of all, Age of Bronze issue #1 in full color from Image Comics goes on sale April 25, 2018. That's next week. This reprint--in new full color--sells for the bargain price of $1.00! 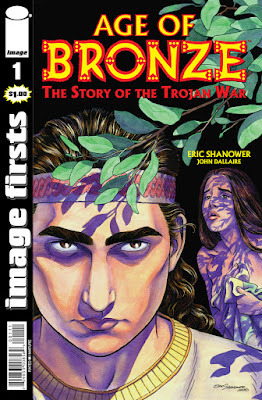 This bargain-price reprint of issue #1 is intended to give readers a sample of how Age of Bronze will look from now on. Find it in your local comic shop or order it digitally from Comixology. You can also order a physical copy here for immediate shipment--while supplies last. 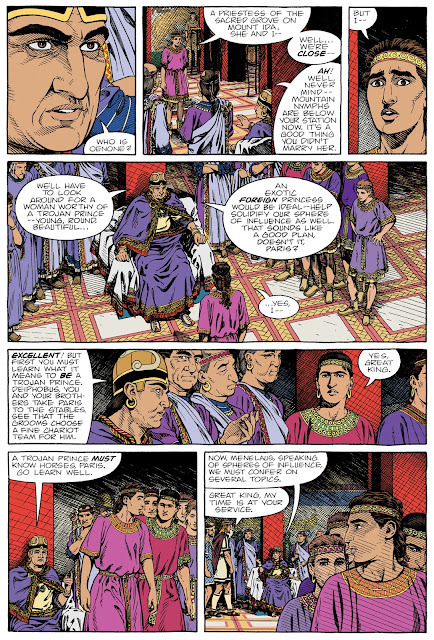 All Age of Bronze graphic novels will receive new color printings. The first book, A Thousand Ships, will be published in full color in September 2018. 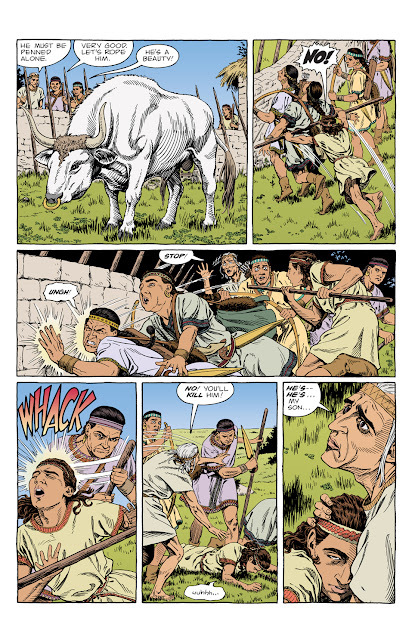 Color versions of each subsequent Age of Bronze book will follow in print annually from Image Comics. Age of Bronze #34, the first new issue in several years, will be published in full color in early 2019. 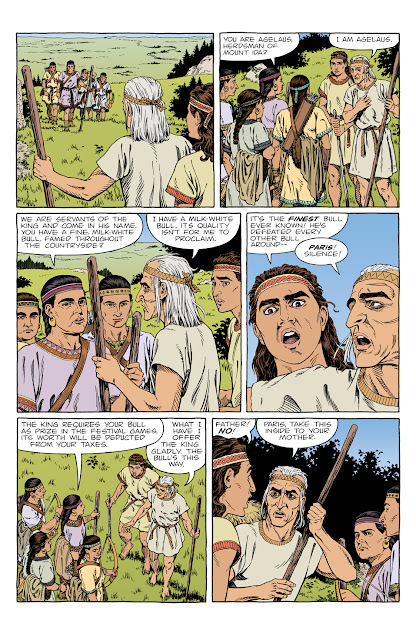 All new Age of Bronze issues will be published digitally in color on Comixology. New issues won't see print--they'll only be available digitally. 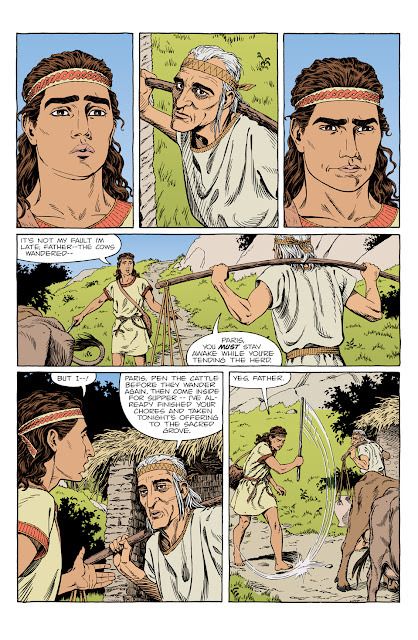 But the story pages from every new Age of Bronze issue will be collected into printed graphic novel format as usual--now in full color. Some of you may remember that the first four issues of Age of Bronze appeared several years ago in color as an app for iPad. That version is being superseded. John Dallaire has refined many color details since those first digital color publications. 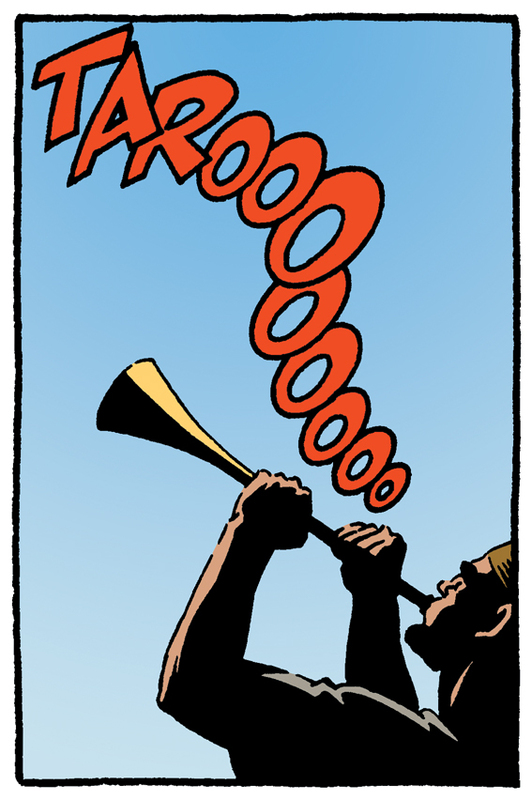 In fact, due to a resolution discrepancy, John completely re-colored Age of Bronze #1 for the new print version. He made quite a few refinements. Eagle-eyed readers will be able to spot many differences when comparing the new color version with the old digital one. So thanks to John Dallaire and to Image Comics for making this all possible. For your enjoyment, here's a six-page preview of Age of Bronze #1 in full color. Click on any page to see it larger. 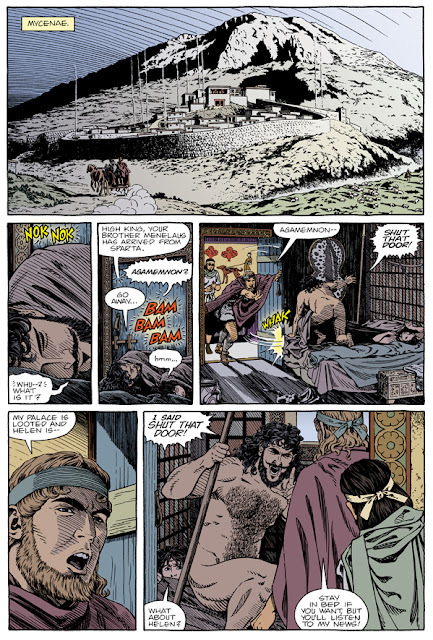 Continued in Age of Bronze #1. Interior page color copyright © 2018 John Dallaire. Ryan Claytor of the Comic Art and Graphic Novel Podcast at Michigan State University conducted an interview with me several months ago. It's now up for your listening pleasure. 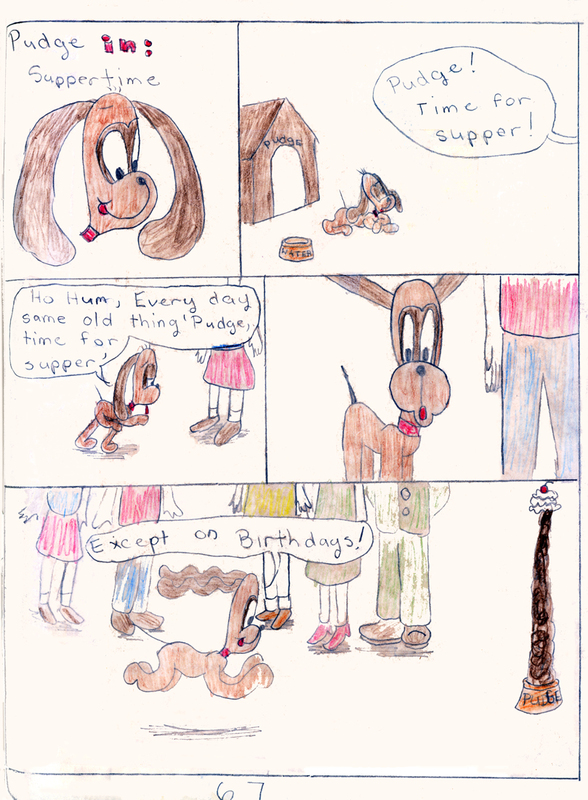 Images include some early comics that as a child I wrote and drew--like the one at right from 1974. Mine! 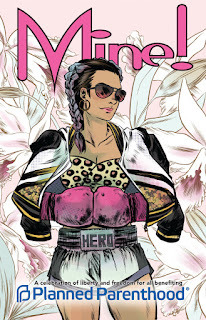 is a new comics anthology published to benefit Planned Parenthood. 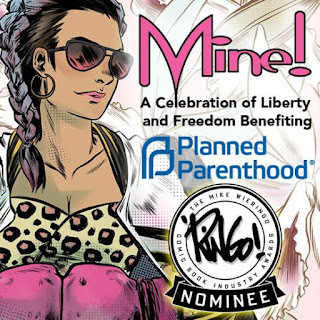 An immense array of comics creators have contributed stories about Planned Parenthood as well as women's empowerment. Mine! 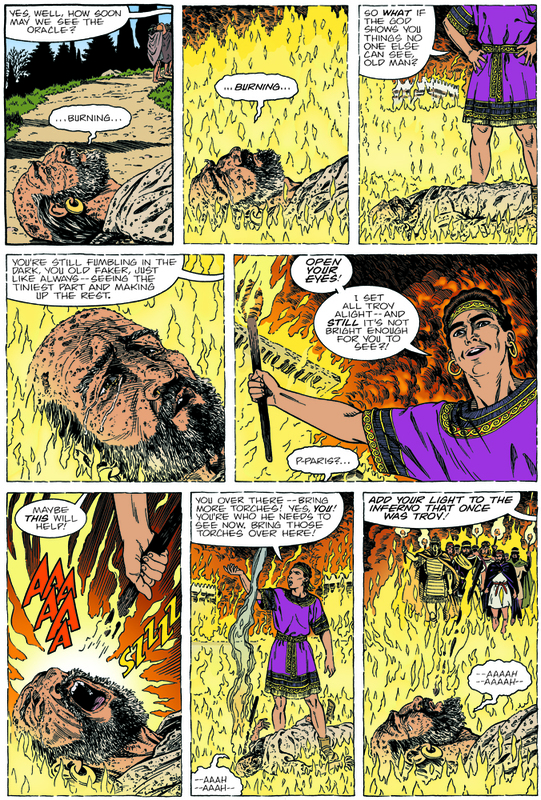 is published by ComicMix and is now available. I contributed to Mine!, a four-page story titled "Matilda Who?" Matilda Joslyn Gage was a major US figure in the 19th century women's movement. She was a thinker, a writer, an activist, and an organizer. 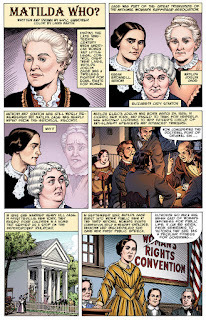 Susan B. Anthony and Elizabeth Cady Stanton were her colleagues. But Matilda became marginalized and history largely forgot her. My story "Matilda Who?" tells why. 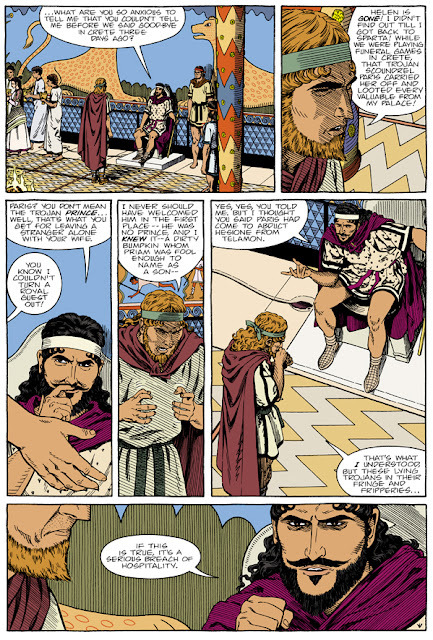 It's colored by award-winning comics colorist Laura Martin. Lots of other comics creators contributed work to Mine! You can find a full list of contents here. Mine! 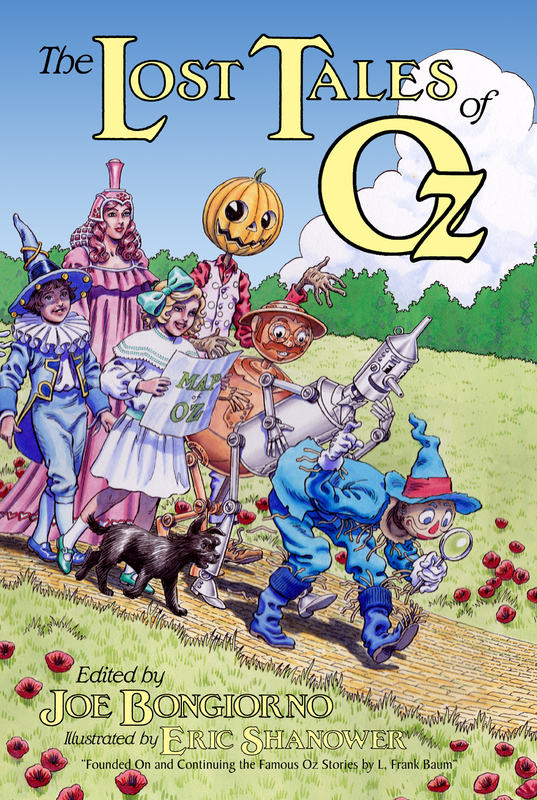 is on sale now at your local comics shop and online comics retailers. All profits go to benefit Planned Parenthood. I hope you'll enjoy reading Mine!